This name uses Spanish naming customs: the first or paternal family name is Aznar and the second or maternal family name is López. José María Alfredo Aznar López (Spanish pronunciation: [xoˈse maˈɾi.a alˈfɾeðo aθˈnar ˈlopeθ]; born 25 February 1953) served as the Prime Minister of Spain from 1996 to 2004. He is a director of News Corporation. Aznar was born in Madrid in 1953, was the son of Manuel Aznar Acedo, army official, journalist and radio broadcaster, and grandson of Manuel Aznar Zubigaray, a former Basque nationalist broadcaster turned Falangist propagandist and a prominent journalist during the Franco era. Both father and grandfather held governmental positions during the years of Spain under Franco. He studied law at the Complutense University of Madrid, graduating in 1975, becoming a Spanish Tax Authority inspector in 1976. As a teenager, Aznar was a member of the Frente de Estudiantes Sindicalistas (FES), a Student Union supporting the Falange, Franco's one-party fascist organization. After 1977 it would become Falange Española Independiente (FEI). After the death of Francisco Franco and the restoration of democracy, Aznar joined Alianza Popular (AP) in January 1979, a few months after his wife. In March he became the Secretary General of the party in La Rioja, occupying the post until 1980. In February 1981 he joined the AP's National executive committee. He became Assistant Secretary General in February 1982. On 26 October 1982 he was elected to parliament, representing Ávila. On 22 June 1985 he was elected to the presidency of the AP in Castile and León. On 2 December 1986 AP leader Manuel Fraga resigned following fierce internal party fighting in the aftermath of another failure to dislodge the ruling Spanish Socialist Workers' Party (PSOE). 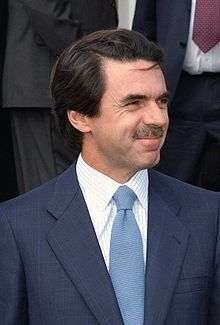 Aznar was not considered senior enough to be a possible successor, and gave his support to the more conservative Miguel Herrero, who lost the leadership battle to Fraga's choice, Antonio Hernández Mancha. As a result, Aznar lost his post as Assistant Secretary General. On 10 June 1987, having resigned his parliamentary seat, he was elected to the Cortes of Castile-León, where he was elected president of this Autonomous Region. Two years later, Aznar was voted by the National Executive Committee to be the new leader of his party, re-founded as the Partido Popular (People's Party, or PP). With Fraga focused on the presidency of Galicia, Aznar was confirmed as leader of the PP at their 10th National Congress at the end of March 1990. In November the PP moved from the Conservative group in the European Parliament to the more centrist Christian Democratic European People's Party. On 6 June 1993 the PP again lost the general election, but improved on their previous performance by obtaining 34.8% of the vote. The PSOE lost its absolute majority and needed to form a coalition government with other parties in order to continue governing. The result was a disappointment for the PP as the opinion polls had predicted a victory for them. They did well in the 1994 European and 1995 local elections. On 19 April 1995, Aznar's armored car prevented him from being assassinated by an ETA bomb. The PP won the 3 March 1996 general election with 37.6% of the vote, thus ending 13 years of PSOE rule. With 156 of the 350 seats (the PSOE won 141) Aznar had to reach agreements with two regional nationalist parties, Convergence and Unity (Catalan) and the Canary Islands Coalition, in order to govern with additional support from the Basque Nationalist Party. He was voted in as Prime Minister with 181 votes in the Cortes Generales on 4 May and sworn in the next day by King Juan Carlos I. The Aznar Government maintained the commitment of the previous government to join the European Union's single currency and showed itself willing to take political risks in order to meet the requirements for membership. In the middle of 1996 it announced a decision to freeze the wages of civil servants in the following year and stood by that decision throughout the fall, despite a series of union-led demonstrations that culminated in protest marches by tens of thousands of Spaniards throughout the nation on 11 December. The Government, with the backing of regional nationalist parties, passed a strict 1997 budget on 27 December, four days before time would have run out for its approval. The opposition United Left coalition argued that the spending cuts and tax adjustments contained in the budget would hurt the disadvantaged and benefit the rich. The budget aimed to enable Spain to lower its deficit to below 3% of gross domestic product, a requirement for joining the EU's single currency. Some critics note that this wasn't the only way of doing so. The Government was also forced to back down on a plan to reduce Spanish dependence on its own high-priced coal when hundreds of coal miners blocked highways and demonstrated in November. The miners persuaded the government to adjust a national electricity plan that would have phased out the subsidy of Spanish coal, making it more expensive than imported coal. Aznar also announced the sale early in 1997 of the nation's remaining minority stake (golden shares) in the Telefónica telecommunications company and the petroleum group Repsol. These golden shares in Telefónica and Repsol YPF, as well as in Endesa, Argentaria and Tabacalera, all presided over by people close to Aznar, have since been declared illegal by the European Union. This marked the beginning of a period of privatizations after the previous PSOE government had nationalized parts of the economy. After the PP's first year in office, the goodwill between it and the major nationalist parties in the legislature, Convergence and Unity (CiU) and the Basque Nationalist Party (PNV), appeared to have lost strength. Both parties had enjoyed leverage over the previous PSOE government, and the PNV in particular stepped back from colluding too closely with the government. Ecological issues came to the fore in Spain during 1998. A vigorous public debate created a new awareness of topics such as environmental pollution and deforestation, and a host of organizations competed to spread the ecological message. The Government, conscious of the political implications of this new concern, was also party to the debate and promised active cooperation. As a reaction against attempts to liberalize the current abortion laws, Roman Catholic groups renewed their anti-abortion campaigns. The economy suffered the effects of the global recession unleashed by the financial crisis in Asia, and the Economic Ministry reduced its 1999 economic growth estimate from 3.9% to 3.7%. The sharp decline in share prices on the Madrid and Barcelona stock exchanges (on average about 20%) created cause for concern among both business associations and trade unions. The latter voiced their concern about the risk of increased unemployment, which remained around 12.5%. Despite this slowdown, salaries increased by an average of 2.3% that year. In 1999, the European Union introduced the euro, a major success for Aznar and his government. Steady economic growth and falling unemployment, though the rate exceeded all other EU member states, won the government public support. The Government's credibility was damaged when the PSOE revealed at the end of the year that the ranks of top Spanish civil servants had increased 15% over the previous year despite PP promises to cut the bureaucracy. Spanish voters reelected Aznar in the 2000 general election with an outright majority. The PP obtained 44.5% of the vote and 183 seats. The Spanish electorate's participation was the lowest for a general election in Spain in the post-Franco era. Spain was one of the fastest-growing economies in the European Union (EU) in 2001, despite inflation nearing 4% and signs of an economic slowdown. However, the government's problems involved politics as much as policies. A number of issues were handled clumsily, including implementation of immigration legislation passed in January and a health scare over low-quality olive oil in July. In the autumn complaints that the government was steamrolling controversial university reforms through the parliament inflamed the opposition. At the end of the year, students all over the country joined in strikes, demonstrations, and sit-ins, often alongside their rectors and professors. Though still outperforming most of its EU partners, Spain failed to escape the effects of the global economic downturn in 2002. Falling exports, declining domestic consumption, and a sharp drop in tourist revenue helped bring annual gross domestic product growth down to an estimated 2%, the lowest level since 1996. In addition, rising crime rates and soaring house prices (up almost 50% since 1998) were the object of widespread public concern, providing opposition parties with powerful ammunition against Aznar's government. The government ran into even deeper trouble in its attempt to reform the unemployment benefit system. A controversial decree-law issued on 27 May introduced new restrictions on entitlement to benefits, making it harder for those receiving welfare to turn down jobs offered by the public employment agency, and phasing out the special subsidy for agricultural workers in the south. The trade unions reacted by calling a 24-hour general strike on 20 June, embarrassing the government on the eve of an EU summit in Seville. The stoppage proved a largely unexpected success. On 7 October, just two days after a major national demonstration in Madrid to protest against the law, new Labor Minister Eduardo Zaplana announced an abrupt U-turn, accepting nearly all of the unions' demands and leaving only the reform of the subsidy for farm laborers on the statute book. A major secondary-education bill also proved controversial. Intended to raise educational standards, the proposed Law of Quality lowered the age at which students were streamed into different educational tracks, allowed special schools in the state sector to select on merit, and introduced a new secondary-school-leaving exam. Opposition to the bill's potential socially divisive effects and inadequate funding for the public educational system brought student organizations, trade unions, and left-wing parties into the streets as the bill was being debated in the parliament in October. Amid the relatively stagnant European economies, estimated GDP growth of 2.3% made Spain the second fastest-growing economy in the European Union in 2003. Continued expansion enabled the Spanish government to proclaim proudly that it would end the year with a budget surplus for the first time in recent history. However; inflation was running at 2.7% (compared with the EU's 1.7%) in November, unemployment stood at more than 10%, almost one-third of the workforce had temporary contracts, and housing prices were spiraling. The European Commission shared analysts' concerns that a hike in interest rates or increased unemployment could send housing prices tumbling, with disastrous consequences for families burdened with unprecedented levels of debt and for the financial institutions that had given them loans. After six years of relative political calm, when political debate was dominated by a consensus within the ruling party on economics, regional nationalism, and terrorism, several issues arose which polarized Spanish public opinion. Like UK Prime Minister Tony Blair, Aznar actively supported the United States' War on Terrorism, despite public opposition. Aznar met with Bush in a private meeting before 2003 invasion of Iraq to discuss the situation of in the UN Security Council. El País leaked a partial transcript of the meeting. The government handling of the wreckage of the Greek Prestige tanker near the Spanish coast, which resulted in a major ecological disaster, also became a divisive issue. He actively encouraged and supported the Bush administration's foreign policy and the US invasion of Iraq in 2003, defending it on the basis of secret intelligence allegedly containing evidence of the Iraqi government's nuclear proliferation. The majority of the Spanish population, including some PP members, were against the war. Spain's major cities were the scene of the largest street demonstrations ever seen in the country as a result of the government's participation in the invasion. Aznar lost some support from those who had voted for the PP in 2000. On a live TV interview aired on the public station while demonstrations were taking place on the streets, he asked the Spanish people to take his word assuring there were weapons of mass destruction in Iraq, of which he had evidence. This is now regarded as incorrect. In January 2004 Aznar called a general election and designated his successor as candidate, Mariano Rajoy, sticking to a pledge of not seeking office for a third term. Despite political tensions, polls suggested that the Popular Party was set to win a third consecutive election on the strength of the economy. An opinion poll carried out by the government-run CIS (which had estimated that 92% of the Spanish people did not support the War in Iraq) in February 2004 estimated that the PP would win an election with 42.2% of the vote while the PSOE would only get 35.5%. Three days before the 2004 general election, 10 bombs killed 191 people in the 11 March 2004 Madrid train bombings. Initially, the government and the opposition stated publicly that it was possible the bombings may have been the work of ETA. However, the PP government continued to blame ETA even after evidence that the attacks may have been the work of an Islamist group emerged, having the Minister of Foreign Affairs Ana Palacio instruct all Spanish diplomats to place the blame on ETA at every opportunity. The public perception that the government hid information from the general population gave rise to a public outcry. Two days after the Atocha bombings, demonstrations took place across Spain demanding news from the investigation, where chants such as "We want the truth before we vote" and "Who is responsible?" were heard. Three days after the train bombings, the opposition PSOE won the elections. The subsequent investigations held by a Parliamentary Committee were characterized by bitter partisan exchanges between the different political parties, with dispute over who may have been responsible for the bombings. Aznar appeared before the Committee in November 2004 and declared his belief that the authors of the bombings were not to be found "in faraway deserts or remote mountains." Aznar said in 2006 that he thought that the attacks were not exclusively perpetrated by Islamists. After leaving office on 17 April 2004 he presided over the FAES think tank, which is associated with the PP. After a 2005 reform, promoted by the current Prime Minister of Spain Rodríguez Zapatero, former prime ministers were admitted into the Spanish Council of State, a position from which he later resigned. Since 2013, Aznar has served on the Leadership Council for Concordia, a nonpartisan, nonprofit based in New York City focused on promoting effective public-private collaboration to create a more prosperous and sustainable future. In October 2008, on the occasion of a visit by the Czech President Václav Klaus to the Spanish capital, Aznar said that anthropogenic climate change is a "scientifically questionable" theory which had become a religion, and whose followers were "enemies of freedom". These views were similar to those expressed by Klaus in his book "Blue Planet in Green Shackles", which was published in Spanish by FAES. Aznar's speech caused some puzzlement, as his government had been a signatory to the Kyoto Protocol in 1998, and it appeared that he had subsequently changed his mind about climate change. The People's Party has since distanced itself from the environmental views of Aznar, classing him among a "sceptical minority" within its membership. However, some People's Party politicians favored Aznar and wanted a public debate on climate change, most notably Esperanza Aguirre. In 2009 Aznar was due to speak to a Heartland Institute conference which was billed as the "world's largest-ever gathering of global warming skeptics". He withdrew at short notice, and in the absence of a public explanation there was speculation that he did so in order to spare his party embarrassment. In 2010 it was reported that Aznar would chair the Advisory Council of the Global Adaptation Institute, a new body concerned with adaptation to climate change. In 2010, Aznar founded the Friends of Israel Initiative, with the stated goal to "counter the attempts to delegitimize the State of Israel and its right to live in peace within safe and defensible borders". Referring to the ill-fated takeover of the Mavi Marmara by Israeli commandos, Aznar said in 2010 that the world must support Israel because "if it goes down, we all go down". He said that "In an ideal world, the assault by Israeli commandos on the 'Mavi Marmara' would not have ended up with nine dead and a score wounded. In an ideal world, the soldiers would have been peacefully welcomed on to the ship." He criticized Turkey, for placing Israel "in an impossible situation" in which it would have to either give up its security or face world condemnation. Aznar concluded that Israel is the West's first line of defense, and must be protected. In 2014, in an address at the British House of Commons Aznar said Israel is needed by the European Union. He said his report recommends that due to its Western culture and the benefits it brings the European Union, Israel should become a full member of the EU without pre-conditions. Aznar's government posthumously granted a medal of Civil Merit to Melitón Manzanas, the head of the secret police in San Sebastián and the first high-profile member of the Francoist government killed by ETA in 1968. Manzanas was widely considered a torturer, and Amnesty International condemned the award. After the 2004 elections it was revealed that Aznar and his government secretly channeled public funds to a United States legal firm to lobby for the bestowment of the Congressional Gold Medal on Aznar. The contract consisted in a first payment of $700,000 USD for the first seven months, followed by $100,000 monthly payments until it reached the sum of $2 million. In an interview with BBC World on 27 July 2006 he voiced doubts about "Islamists" being the sole culprits of the disputed 2004 Madrid train bombings, "You know in this moment some perpetrators of the attacks, but you do not know who imagined the attack, who is the leader of the attack, who is the idea (sic) of the attack, who established and supported means for the attacks, who defined the logistics of the attacks, who established the strategies of the attack. Nothing...I think that one part of the perpetrators are Islamists, but I think that this is not only an Islamist attack." During a Washington, D.C. conference at the Hudson Institute, a conservative U.S. think tank, on 23 September 2006, referring to Pope Benedict XVI's comments on Islam and violence, Aznar asked why Muslims had not apologized for occupying Spain for 800 years as Al-Andalus. He then called the Alliance of Civilizations initiative "stupid." His reference to apologies was a response to the demonstrations asking the Pope to apologize. One PP official clarified Aznar's speech by saying the Prime Minister thought it is pointless to apologize for historical events. In 1977 he married Ana Botella, by whom he has three children: José, María Ana and Alonso. Their daughter married Alejandro Agag at El Escorial on 5 September 2002, and they have four children. In 2008 in response to rumours, Aznar denied being the father of Zohra Dati, daughter of Rachida Dati, the then French Minister for Justice. The mother subsequently claimed that another individual, Dominique Desseigne, was the father of her child. Collar of the Order of Isabella the Catholic (19 April 2004). Grand Cross of the Order of Prince Henry (23 August 1996). Honorary Doctorate, University of Florida (1998). Honorary doctorate from the Catholic University of Sacred Heart of Milan (18 January 2007). Honorary Doctorate by the Peruvian University of Applied Sciences (2 October 2008). Honorary Doctorate, University of Santiago de Chile (5 October 2008). Honorary Doctorate by the Universidad Francisco Marroquin in Guatemala (11 November 2008). Honorary Doctorate by the Universidad San Ignacio de Loyola in Lima (21 March 2009). Honorary Doctorate, Universidad CEU Cardenal Herrera (20 January 2009). Honorary Doctorate from the Catholic University San Antonio (11 November 2010). Medal of Honor of Madrid (15 May 2011). Honorary Doctorate from the University of the Americas Ecuador (11 October 2011). ↑ "Extended biography at Fundación CIDOB" (in Spanish). Fundació CIDOB. 2004. Retrieved 2008-01-03. ↑ "A letter written by Jose María Aznar in 1969 to the editor of a falangist journal" (PDF). 1969. Retrieved 2008-01-03. ↑ Azner, Jose; Fact Monster. ↑ "Elections to the Spanish Congress of Deputies – Results Lookup". Election Resources on the Internet. 2000. Retrieved 2008-01-03. ↑ "Elections to the Spanish Congress of Deputies". Election Resources on the Internet. 2004. Retrieved 2008-01-03. ↑ During a conference in Pozuelo de Alarcon, Madrid, on 8 February 2007 Aznar said there were no weapons of mass destruction in Iraq prior to the Iraq War, but that when he believed there were WMDs and no one could disprove their existence. "Aznar sabe "ahora" que no había armas de destrucción masiva en Irak". 20 Minutos. Retrieved 2008-01-03. ↑ "Aznar takes advantage of an act in Madrid with PP loyals to rectify his 2003 accusations about the weapons of mass destruction in Iraq". European Social Survey. Archived from the original on 14 November 2007. Retrieved 2008-01-03. ↑ "BBC: Scores die in Madrid bomb carnage". BBC News. 11 March 2004. Retrieved 2008-01-03. ↑ Juan José Ibarretxe Markuartu, regional president in the Pais Vasco: "When ETA attacks, the Basque heart breaks into a thousand pieces." ↑ "Exteriores pidió a todas las embajadas que defendieran la authoría de ETA". Cadena Ser. 2004. Retrieved 2008-01-03. ↑ "Palacio ordenó a embajadores decir que ETA cometió los atentados". Barcelona Independent Media Center. Retrieved 2008-01-03. ↑ "Miles de personas exigen en las calles españolas que se les diga la verdad antes de votar". El Pais. 2004. Retrieved 2008-01-03. ↑ Paloma D. Sotero and Elena Mengual (2004). "Aznar ataca al Gobierno y pide que se 'investigue la verdad' del 11-M". El Mundo. Retrieved 2008-01-03. ↑ James Mackintosh (2007). "Centaurus hires high-profile advisers". Financial Times. Retrieved 2008-01-03. ↑ Dan Milmo (22 June 2006). "Former Spanish PM to join Murdoch board". London: Guardian Business. Retrieved 2008-01-03. ↑ Club de Madrid is an independent non-profit organization created to promote "Democracy that Delivers". It is composed of more than 100 Members, all democratic former presidents and prime ministers from around the world. ↑ "Support the Prague Charter". Jerusalem Post. 11 June 2007. Retrieved 30 December 2010. ↑ The book was originally published in 2007 in Czech (Modrá, nikoli zelená planeta): the Spanish title is Planeta azul (no verde). ↑ "Former Spanish President..." (Press release). Global Adaptation Institute. Retrieved 4 September 2013. ↑ "Ex-Spain PM: If Israel goes down, we all go down". Ynet. Retrieved 20 June 2010. ↑ "Former Spanish PM Aznar: Israel Needed by European Union, Should be Accepted as Member State". 7 February 2014. ↑ "No deben tolerarse las recompensas a torturadores (They should not tolerate rewards to torturers)". Amnesty International. 30 January 2001. ↑ "Entrevista BBC Aznar, 24-07-2006 (Parte II de 3)". BBC World via YouTube. 2006. Retrieved 2008-01-03. ↑ "Aznar: "Muslims should apologize for occupying Spain for 800 years"". YouTube. Retrieved 2008-01-03. ↑ "Aznar se pregunta por qué los musulmanes no se disculpan 'por haber ocupado España ocho siglos'". El Mundo. Retrieved 2008-01-03. Wikimedia Commons has media related to José María Aznar.